How can I place an order with Johnny's? Johnny's also offers credit accounts to commercial customers. For more information, refer to Commercial Sales. Gift Certificates: How do I use it? Does it expire? Are there any restrictions? What if I lose it? Gift certificates can be used as partial or full payment for all order methods. When placing your order, simply indicate the gift certificate number and its dollar value. If the amount of your gift certificate is larger than your order amount, another gift certificate will be issued. If the remaining gift certificate credit balance is less than $5, a check will be issued rather than another gift certificate. If you have lost a gift certificate, we can help. Please Contact Us for assistance. Yes, a recent Supreme Court ruling (South Dakota v. Wayfair, Inc., Overstock.com, Inc., and Newegg, Inc.) changed the state sales tax obligations for all companies that sell remotely through websites and catalogs. Johnny's Selected Seeds now charges sales tax on orders shipping to a number of states where we are required by law to collect and remit state tax, unless the customer is a tax-exempt organization or a reseller with a current exemption certificate on file with Johnny's. Please refer to the Sales Tax FAQs for more information regarding sales tax charges and exemption certificates, and Contact Us should you require further assistance. Yes, we accept international credit cards. However, these cards usually have daily spending limits. Depending on the size of your order, we may need to divide it into multiple orders that ship on different days, to stay within your card's daily limit. No. Currently, we are not able to accept gift cards as a form of payment. We're here to help you! Please call 1-877-564-6697 to speak with one of our knowledgeable Contact Center Specialists. We're open year-round, with extended hours during the busiest planning, planting, and growing months. If you prefer to email your message, please use our convenient Contact Form. We will be back in touch with you within 48 business hours. Where else can I go to buy your products? 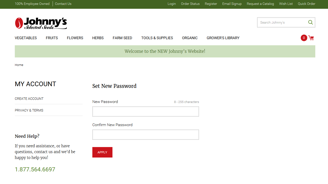 To find the nearest retail store in the US that carries Johnny's Selected Seeds, see our Store Locator. We suggest calling ahead to verify hours and availability. Johnny's is committed to your success. If you are not 100% satisfied with your purchase, we will replace the item or refund the purchase price. For more details and instructions, refer to Returns & Exchanges. No. For your security, we do not retain credit card details on file. For more information, see Privacy & Security. We will charge your card when we receive your order. Yes. We are committed to protecting your personal information. Johnny's uses HTTPS technology to provide you with the safest, most secure shopping experience possible. If you prefer not to transmit your card information over the Internet, simply Contact Us to place your order by phone, fax, or regular mail. Does your site have a secure connection? Our site uses SSL (Secure Sockets Layer) encryption to secure the communication of all sensitive information passing between your web browser and our servers. Can I change an order after I've submitted it? We process orders very quickly, and once an order enters the fulfillment process we may be unable to modify it. We apologize for any inconvenience and hope that in the majority of cases, our faster processing times work to your advantage. If you do need to change, add to, or cancel an order, please Contact Us as soon as possible. We will do our best to accommodate your request. 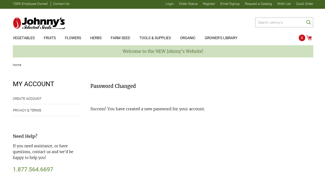 Orders placed via johnnyseeds.com undergo immediate preauthorization for the total order amount, and cannot be added to. If you have forgotten an item, you will need to place another web order or Call Us. We will be happy to help you! What is meant by a product "substitute"? Why would you need to substitute a similar seed? If an item is sold out or a crop failure, we may recommend a variety very similar to the original item, that will meet your needs. We would send an email notification or a letter with a recommended substitute and ask you to contact us if you would like to place an order for the substitute. It is our goal to deliver the high-quality goods and services you have come to expect from Johnny's. If you change your mind on an order, we will make every effort to honor your cancellation request. If one of the items you have ordered is on backorder, and subsequently it becomes unavailable due to a crop failure, we will cancel your order and send you a cancellation notification. The most expedient way for us to contact you is via email. If we do not have an email address on file for you, we will send you a letter through the postal service. What is meant by a "backordered" item? A backordered item is one which is not currently available, but which we anticipate will become available within the near future. What is your policy regarding backorders? While we make every effort to ship orders in their entirety, there are times when certain products may be delayed. Most backordered items become available within 30 days of the purchase date, but backorder dates are subject to change. If an item becomes further delayed, we will send an email notification or mail a letter to those without email notifying you of the delay. Please Contact Us with any additional questions you may have regarding backorders. Is it possible for me to preorder an item that is marked "Out of Stock"? If an item is currently marked out of stock, we cannot accept any orders for the item. If an item is currently marked backordered, however, it can be ordered at any time. My item is listed with a "Later Ship Date." Why has the ship date changed since I placed my order? There are times when our suppliers are unable to meet our expected receiving dates. Unfortunately, when this happens, we must adjust our ship date. If the ship date is pushed out two weeks or more, we will send an email notification or mail a letter to those without email notifying you of the delay. If I cancel my backordered item, will I receive a refund? If you paid by check or money order, you will receive a refund check in the mail for the cancelled item. If you used a credit card for payment and the backordered item has not yet shipped, we will refund the amount to your card. On domestic orders, Johnny's applies standard shipping charges based on the order subtotal. All nondomestic charges are based on the weight of the order. For more information regarding our shipping charges and methods, please refer to our US Shipping, Canada Shipping, or International Shipping pages. Other: Large bulk freight (truck) courier. Bulk orders weighing 300 lb or greater can be shipped by a freight courier. We will provide you with the best method for your order. We can also accommodate your courier of choice. How do you decide which method to use for shipping my order? Shipping methods are selected on the basis of destination zone, origin address, and the weight of the package. For specific information on our shipping rates, please refer to our US Shipping, Canada Shipping, or International Shipping pages. Johnny's ships worldwide, where we are able to comply with all agricultural import regulations. For more details, see our US Shipping, Canada Shipping, or International Shipping pages, as well as our Table of Restricted Countries. (For the most current and detailed information pertaining to restrictions on shipping agricultural products to international destinations, we recommend contacting your Ministry of Agriculture). All Standard, Next-Day Air, and 2nd-Day Air orders placed by 2:00 PM Eastern Time (1:30 PM ET on the web), Monday through Friday, will ship the same day on all in-stock items. Orders placed after this time, or on weekends, will be processed for shipment the next business day. Can my order be expedited if needed? Yes. Johnny's offers faster delivery options. Please let us know your preference at time of ordering. What is meant by "FOB Shipping" and "Zone Shipping Charges"? Freight On Board (FOB) and Zone Shipping Charges are Additional Shipping Charges applied to certain products due to their size, weight, or dimensional shape. In our catalog, items and sizes requiring such Additional Shipping Charges are denoted by ared asterisk (*). On our website, items or sizes requiringAdditional Shipping Chargesare noted under Additional Information on the individual product page. In the Shopping Cart, the fee is line-listed asSurcharge. The charges are broken down into Zones A, B, C, and D. The shipping address determines the zone and its associated charge. For Shipping Zone definitions, see Shipping Information. My product says it can't be shipped to a certain state or country. Why? Johnny's shipping restrictions reflect state and federal regulations that limit by law the transportation of certain items across borders or along public transportation routes. Such restrictions may relate to introduced, invasive, or noxious species or to other materials in the restricted products. We encourage you to Contact Us to request a recommended alternative. 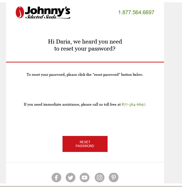 If you're a returning customer trying to access your Johnny's account, please note that our new website requires you to reset your password to access your account. Click on the "Forgot Password?" link above the Password box on the Login page. See also the instructions below for details. We sincerely apologize for the inconvenience. Click the "Login" link in the top navigation bar. This will take you to the "My Account" page. A pop-up box will appear, requesting you to enter the email address you used to create your account. Fill in the Email Address, then click the red "Send" button. A second pop-up box will appear, containing a message directing you to check your email. 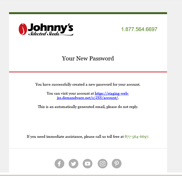 Check your email in-box for an email from Johnny's containing a reset-password link. 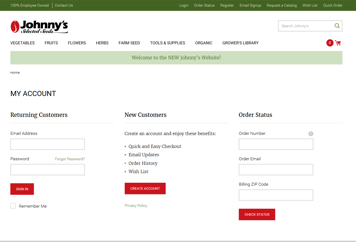 The email will come from "service@johnnyseeds.com," so if you do not see it, check your junk box to be sure your email program is not blocking that address. You should see the following message indicating that you have successfully reset your password. You should now be able to click on the "Login" link in the top bar of the website, as depicted in Step 1 — and log in with your new password. If you continue to experience problems accessing your account, please call us toll-free at 1-877-564-6697 during business hours, and a customer service representative will assist you.